The Irish Cultural Center invites you to an afternoon of Celtic fiddle and folk rock with House of Hamill – Brian Buchanan (Enter the Haggis), and Rose Baldino (Burning Bridget Cleary). 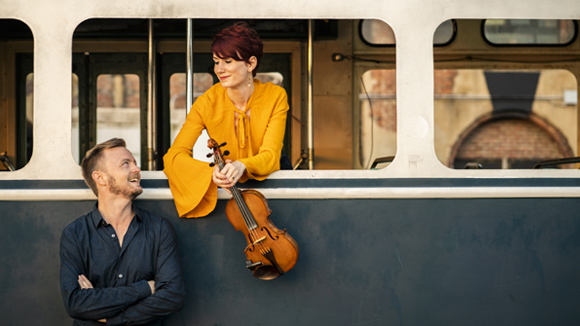 Their intimate, relaxed performances have been extremely popular in their many years of playing for the ICC, and include new fiddle tunes and unique original compositions, plus new life breathed into traditional and contemporary songs. House of Hamill will perform on Sunday, March 3 at 3:00 pm at the ICC’s Irish House Restaurant and Trinity Pub at 429 Morgan Road, West Springfield, MA. Doors open 1:30 pm. Food and drinks will be available for purchase (not included in ticket cost). Seating is general admission. Table seating is first come, first served; seating is also available in attached function room, where some views may be restricted (tv screen also will broadcast show in this room). Please let us know if special seating is required. Whether House of Hamill is playing songs from their debut album “Wide Awake”(2016) or stomping through a set of original jigs and reels from their follow-up “March Through Storms”(2018), their chemistry onstage is always engaging and often hilarious. You’ll leave with tired feet, a huge smile, and a new appreciation for the versatility of folk instruments in a modern context.